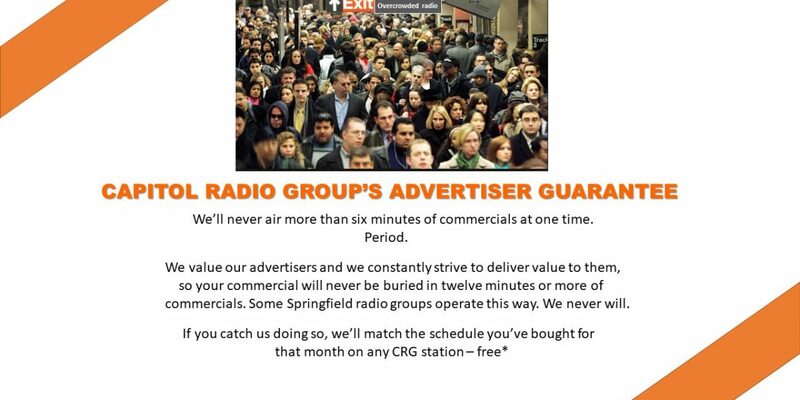 1) You must be a current advertiser on any CRG radio station. 2) If you hear us play more than six minutes of commercials, you must submit either a recorded copy of the commercial pod in question, or provide a written list of all commercials that aired, in the correct order. This list will be cross checked with the folks who schedule our commercials. 3) Ten or fifteen second station promotional announcements do not count – either recorded or live. Any recorded promotional announcement thirty seconds or more does count. 4) Commercial pods that include live remotes do not count as sometimes the length of the commercial can vary when a client spokesperson is on the air. 5) If you catch us red-handed, and submit proof, you will be rewarded with a bonus schedule equaling the number of commercials you bought in the month in which the guarantee was broken. These bonus commercials will air M-Su 6a-12m and are preemptible. Any preempted commercials will be made good at the earliest opportunity. 6) The guarantee is in effect until December 31, 2019 but may be discontinued at any time with 30 days notice.